Water in motion engages our senses; It's beautiful to look at, relaxing to hear, thrilling to touch, and restorative to our bodies and spirits. A swimming pool with a water feature or waterfall is a water-on-water experience that serves as a focal point and lures you into its environment. Just like other elements of your property, you want to choose water features that complement your home's and pool's architectural style. They should also fit within your budget and personal taste. Think about proportion and scale when selecting a pool or spa water feature, making sure that a fountain or fixture is not too monumental for the size of your pool and yard. If it's an existing pool, is the shape geometric or freeform? Rocks, real or faux, look best with curvilinear, naturalistic-shaped pools, while more simple architectural features enhance a modern or rectangular shape. Unless it is a very basic water feature, hire a pool builder, electrician, plumber, or pool technician to install a fountain or waterfall. Waterfall: Often built with rocks or boulders (real and faux) as part of a naturalistic pool design, waterfalls are one of the most popular water features when paired with swimming pools. Water Wall: Just like it sounds, a waterfall spills out from a horizontal spout placed on a tiled or decorative wall near the pool. Rain Curtain: A narrow and often wide sheet or curtain of water usually mounted on a wall, pergola roof, or overhang, that falls into the pool. Scupper: Similar to a sconce, a scupper is a slot or spout that is attached to a wall or pedestal. Water flow styles include chute, trough, and sheet. Sheer Descent: Appearing like a thin sheet of glass, this type of waterfall drops or forms an arc as it flows away from the pool wall. The opening of a sheer descent can range from half a foot to several feet wide. It is usually mounted flush with a top surface. Sconce: A decorative element attached to pool walls out of which pour narrow streams of water. Sconces can be shapes, architectural pieces, urns, vessels, or characters, like animals. Bubblers: Aka gushers, are small jets in the floor of a shallow surface of the pool that shoot streams of water that gurgle and bubble up; heights of the streams can be adjusted. Spillover Spa: An integrated custom-designed spa that is raised above the pool, serving as a sort of utilitarian water feature as it spills or trickles into the swimming pool. Deck Jets: Often called a laminar or pencil jet, this type of water feature is installed into pool decking and shoots a narrow, arching stream of water into the pool. For additional fun and drama, deck jets can be illuminated with color-changing LED lights. Statuary: Similar to a sconce in that a statue is usually figural–animal, fish, bird, or person. Water usually bubbles out or shoots a stream. In a Texas city noted for its Victorian architecture, Austin Water Designs was challenged with creating a contemporary outdoor space and pool that would work with a traditional-style house and hilly terrain. The design firm cleverly came up with a geometric pool for their San Marcos clients that uses a wall as an outdoor bar. An ashlar water wall spills elegantly into the pool and is a feature of another wall that extends from the pool to the outdoor living room. A stacked-stone low wall provides privacy, a place to sit, a shelf for container plants, and a surface for scuppers that flow into the geometric pool, all of which were designed by Braswell Architecture. An 8x10-foot spa designed by Ekman Design Studio provides a low wall from which water flows from three scuppers. Colorado Pools installed the pool on this Cherry Hills, Colorado outdoor environment. The challenge: to design a modern swimming pool with all of the technological features and conveniences in the yard of a historic 1920s home located in the Kensington neighborhood of San Diego. For starters, make it simple–use materials that repeat or complement those used during the era, and don't allow it to compete. Distinguished Pools designed a rectangular pool with a horseshoe-shaped spa positioned at the top and center of the design, which is only flooded when the pool is running. Golden Sienna mosaic travertine tile echoes the home's era. Three custom-fabricated copper waterfalls create a smooth sheet of water, providing a tranquil environment. A tiki shack gazebo sits atop an island-themed pool environment by Surrounds Landscape Architecture in the Washington D.C. area. The tropical landscape includes rock formations and has several different sizes of waterfalls that flow into the pool, along with an exotic fire feature. A 1,000-square-foot backyard of a townhouse in Tucson was smartly designed by Kathryn Prideaux to encompass all of her client's requests by using low, vertical walls and a desert jewel box color palette. Since space was tight, a spool gives the homeowners more of a pool-like experience than a spa, especially important in a desert climate. Just the sound of the waterfall coming from the scupper can help cool off whoever's hanging out on the patio. Glossy blue tiles help extend that water-like feel throughout the landscape. A modern geometric pool with textured, colorful chartreuse privacy walls created by Bianchi Designs features concrete decking that is used for coping, with mosaic tile at the waterline. A trio of elegant architectural vessels spill sheets of water into the pool, creating movement and cooling off things off in the desert climate. A tall order for a Texas client: a swimming pool that is beautiful to look at, yet entertaining for their grandchildren when they visit the 1,000-acre ranch near Austin. It took 112 tons of hand-selected boulders and rocks from Oklahoma to build a pool environment with a grotto, waterfall, and hidden slide. Austin Water Designs created a masterpiece: a lagoon-style pool with an integrated spa features a stone tanning ledge with LED colored bubblers, a sound system, a slide that starts at the top of a waterfall and curves downward, and several jump-off perches–all spilling swimmers into a safe depth. The spa waterfall is heated to ensure there are no temperature extremes. A short wall finished with cement render and paint connects a focal point wall made of vein-cut silver travertine. Designed by FreeStyle Pools of Sydney, Australia, the water feature is a scupper, while LED illuminated laminars are placed behind the smooth walls for more water effects. Designer Evelyn Benatar worked on an Arts and Crafts style house in Roslyn, New York that features a pool built with old stones and bricks, along with a water feature that cascades down steps. This is the house to which everyone hints for an invitation. Distinguished Pools created a resort-style yard with a fun pool and spa featuring an island fire pit with circular seating, along with a raised boulder platform with a built-into-the-rocks slide and waterfalls at different heights. Scuppers are placed on the island spa outer wall and throughout the design for lots of movement. A raised spa designed by Braswell Architecture is used as a water feature to spill into the geometric pool. A built-in spa serves as a vessel for a water feature that spills into the connected swimming pool of this freeform design by Platinum Poolcare of Chicago. A small pool in a contemporary courtyard features bubblers and floating concrete path steps, designed by Braswell Architecture. Water spills from inset vessels of a San Antonio, Texas pool designed and built by Dynamic Environments. Rich, deep earth-tone stones and mosaic tiles complement one another and reflect the surrounding environment. When you have limited space in a narrow yard, you use vertical space, which is what Horton Land Works did for this Miami pool environment. Horton designed a wall with blue tile backsplashes upon which plaques with decorative sconces spill water into the pool. A blue-tiled spa spills into the pool, while a wood deck provides a place to lounge in the sun. A reproduction of an ancient lion spits a fountain of water into a curvilinear swimming pool that's part of a Mediterranean landscape designed by Braswell Architecture. The cast-stone lion is from Haddonstone. Braswell used "old yellow" stone quarried near Sisterdale, Texas not far from the home's location in San Antonio. A guest house serves as the backdrop for a reflecting pool. Bianchi Design emphasized the interplay of the windows with colorful pottery and cascades of water from scuppers that spill onto submerged "floating" step stones in the pool that lead to the spa. Hunter Leggit Studio designed a modern home in Newbury Park, California, featuring a sophisticated lap pool with streams of blue light that look like thin streams of water. Or is it water? Only the homeowners, their friends, Hunter Leggit, and HomeSpace Builders know for sure. A courtyard pool with beautiful blue ceramic fountains leads to the home's larger swimming pool, designed by Randall Stofft Architecture and Design of Florida. A raised platform next to the spa and accessible on both sides serves as a place to sunbathe on lounge chairs, then dip your feet into the irresistible sheer descent water feature that flows into the pool below. Creative Environments designed a visually exciting space with geometrics and circles. Pulling back, this view shows how the sheer descent feature fits within the entire pool and outdoor environment, with scale and placement. Keeping the pool's geometric shape, Creative Environments designed a step-up platform that provides a spot for sunbathing, while the descent flows naturally from this area, enticing guests to dip their feet into the waterfall before plunging into the pool. A semi-U-shaped pool in Miami features a wall with stone accents and mounted Bobe scuppers that flow into the pool. Designed by Horton Land Works, the pool features a wooden platform walkway that gives it a beach vibe. Sitting front, raised, and center is a custom-built stone spa designed by Creative Masters with seating that becomes a lively focal point when the laminars and LEDs are turned on. A sprawling Tuscan style home and yard with stone hardscape by Braswell Architecture uses several types of water features in the pool, like deck jets embedded for whimsical, glistening arcs, and wall-mounted scuppers that create waterfalls. Swimming in this curving pool that is partially covered by a patio roof is a relaxing experience, especially when the rain curtain is activated. Designed by Robinette Architects, the landscape also features a pool surround made of light acid-etched tinted concrete. The scupper water feature for an L-shaped pool designed by Project Designs Architects of Brisbane, Australia, is smartly positioned up high for a dramatic drop into the pool, where it entices potential swimmers. A tiled wall with a waterfall becomes the focal point of this classic 10x26 foot rectangular swimming pool by Aqua Technics of Perth, Australia. Jet streams of water shoot out from a side wall in perfectly symmetrical fashion. The pool environment was designed by Braswell Architecture of San Antonio, Texas. Deck jets create a festive atmosphere as they shoot streams of water that arc high over the pool. Jonathan Keep Landscape Design of Edgartown, Massachusetts, designed this backyard water environment. A sculptural Palo Verde tree watches over a pool and landscape designed by Kirk Bianchi for a home in Arizona. Bianchi mounted a series of small spillways on the wall above the pool to emphasize the central planter behind the pool. A freeform butterfly-shaped pool features a couple of rock formations with waterfalls, along with gusher fountains in the shallow end, designed by Creative Environments. A mosaic-tiled spool is cleverly tucked into a corner near the back door of a house in Arizona. Horton Land Works designed the environment, which includes high wall-mounted scuppers that gracefully flow into the spool. 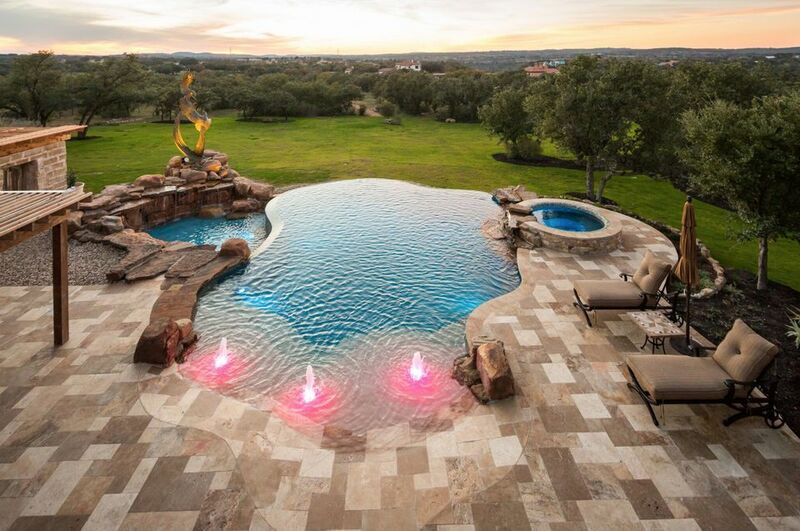 A couple of artists requested an aquatic masterpiece from Austin Water Designs for their Texas hill country property. The design firm delivered with a pool that is closely situated to the home but is oriented to take advantage of the breathtaking view. Some 50 tons of river boulders from Oklahoma were used for the waterfall, spa, and fire features, while sand-hued aggregate replicated a beach entry. Hand-made glass tile was used in the pool, spa, and catch basin. Color-changing LED bubbler fountains were integrated into the beach entry to make the environment even more exciting when the sun goes down. A Laguna Hills, California pool received a makeover including Glasshues tile from Rock Solid Tile, construction by Fluid Dynamics—which included a slide waterfall and water wall, and landscaping by ​Terry Design. Okay, so there's no room for a pool. The next best thing is a large spa with a waterfall feature and a fabulous fountain, especially if it's viewed from the kitchen, one of the most-used rooms in a house. Designed by Dupuis Design of San Clemente, California, the fountain features a wall with panels of different materials, like pebbles, various types and cuts of stone, and wood. Scuppers are staggered for a dramatic effect. The stone wall exterior of a grotto that is part of an extreme pool environment created by Caviness Landscape Design includes a meandering stream that connects all of the water features and leads to the magical grotto. The result of a project that was constructed over a few years, this extreme pool environment in Oklahoma created by Caviness Landscape Design features a pool with a man cave inside a swim-through grotto. Among the luxurious elements: A beach entry, multiple waterfalls, native Oklahoma boulders, a handmade stone grotto, swim-up bar, grotto kitchen, flagstone patio, outdoor television, and integrated sound system. A remote control operates the water features and the Color Kinetics custom light shows. A Northern California backyard features travertine tile with a cream-colored pre-cast coping for a rectangular swimming pool. Designed by Creative Environments, the mosaic-tile edge and surrounding basin are water features of this infinity pool, which offers a view of surrounding hills. Deck jets and gurgling bubbler fountains provide more liquid entertainment. Landscaping and installation are by Michael Tebb Design, with home construction by Crowder Construction. For a pool and spa in the Arizona desert, Bianchi Designs gave his clients something cool to look at even when they aren't in the pool. It all starts with a water bowl that flows into the mosaic tile spa, which spills into the blue waters of the pool. The effect is clean, serene, and stunning. A Houston area home with a Spanish/Mediterranean design features an intimate courtyard pool surrounded by native landscaping. Mirador Builders added gurgling bubbler fountains at opposite ends for a festive touch, especially when illuminated in the evening. A stone waterfall designed by Creative Masters follows the natural progression away from this house, enticing its homeowners down the stairs and hill, into the pool to enjoy the terraced landscaping and natural setting. While usually known for spectacular extreme pool environments, Caviness Landscape Design also shows their design know-how with this mosaic-tiled swimming pool that smartly uses limited space by locating it off the back steps. Sheer descents flush with the staircase landing and sconces on the side wall set the water in motion as you step out the back door. A well-thought-out juxtaposition composed of more than 200 tons of boulders were used for a stunning pool environment in Lodi, California, designed by Spring Creek Water Gardens and Landscape. Pathways were created with lots of attention to details and angles to accommodate numerous waterfalls and a 30-foot covered-tube slide. A Palm Springs Midcentury modern home designed by Palmer and Krisel for Alexander Homes features a subtly updated swimming pool by H3K Design that honors its esteemed architects and builders. What's new: the mosaic-tiled spa with a waterfall that spills into the pool, along with deck laminars to stir up some fun, especially when the colored LEDs are turned on at night. In a dry, desert climate where hardscape is emphasized, Bianchi Designs created a sculptural water feature for this pool environment featuring local stone and long chutes that flow into the pool. An Oklahoma pool with dramatic boulders and waterfalls designed by Caviness Landscape Design includes a misting system for added effects and to cool off swimmers. Creative Environments constructed a pool built into a slope that uses the terrain to work in rocks, boulders, scuppers, and a slide for a house in Lafayette, California. A romantic-looking pool in Northern California's wine country designed by Roche+Roche features a magnificent stone Craftsman style fountain with scuppers that create a relaxing sound as they flow into the water. Even when not used for swimming, a pool can ​cool off a space like this Old World-style courtyard in Newport Beach, California designed by Neolithic Design.